Russian interference in the 2016 US elections should come as no surprise. Moscow, both under Soviet and neo-Soviet (Putinist) rule, has attempted to influence US elections since the 1920s – usually on the Democratic Party side. The Soviets historically used the communist-controlled unions and co-opted journalists as the means to manipulate elections. Currently, the Soviets use their old tactics in addition to manipulate social media outlets such as Facebook and Twitter. Leading Soviet nuclear physicist Andrei Sakharov quoted Soviet premier Kruschev in 1961 claiming credit for helping to elect President Kennedy the previous year in his Memoirs. This is credible, because the pro-Soviet, communist-controlled US labor unions, especially in Chicago, supported Kennedy and he won that election by an incredibly narrow margin – with allegations of widespread voter fraud in Illinois’ Cook County. 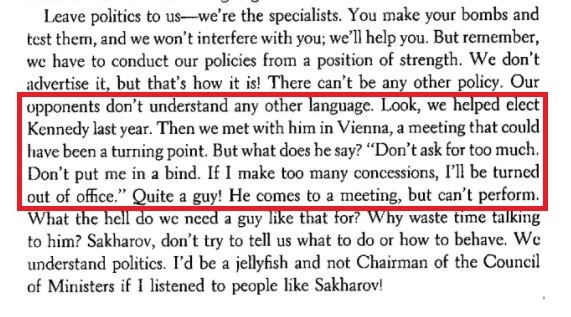 According to Sakharov, Kruschev also expressed disgust that when the Soviets met with Kennedy after the elections in Vienna, they did not get the concessions they had hoped for. “President John F. Kennedy and Soviet Premier Nikita Khrushchev met in Vienna for a two-day summit. In a letter delivered to Khrushchev in March, Kennedy proposed the two leaders meet for an informal exchange of views. Accordingly, they conferred without a set agenda. 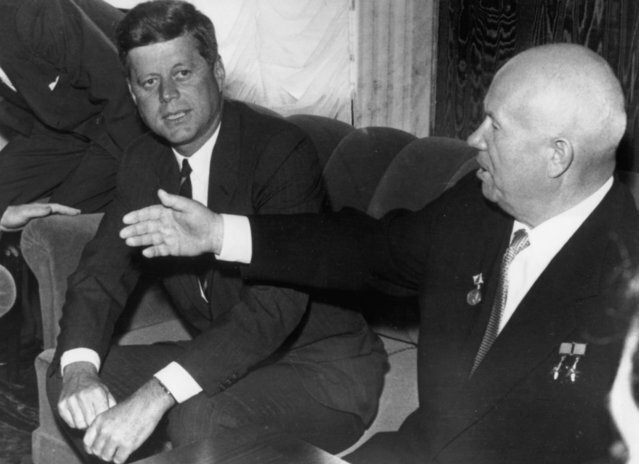 In addition to Berlin, Kennedy later told reporters, Khrushchev had berated him on a wide range of Cold War issues, including ‘wars of national liberation’ and nuclear weapons. After Kennedy was assassinated, the Soviets worked to elect his successor Lyndon Johnson in 1964. Johnson (who had worked under Communist Party member Aubrey Williams in the Roosevelt-era National Youth Administration) beat conservative Barry Goldwater by a wide margin. By 1960, Chicago Communist Party member David Canter (who had been raised in the Soviet Union) had teamed up with another well known Chicago Communist Party USA member, LeRoy Wolins. The pair owned a company called Translation World Publishers, which specialized in publications from and about the Soviet Union. The company soon attracted the attention of the House Un-American Activities Committee (HUAC), which suspected Canter and Wolins of being conduits for Soviet propaganda. The false charge that Goldwater was a racist was only one of the smear campaigns used against his candidacy by the Soviets and their surrogates. The American Communists covertly covertly assisted in this “active measures” campaign. 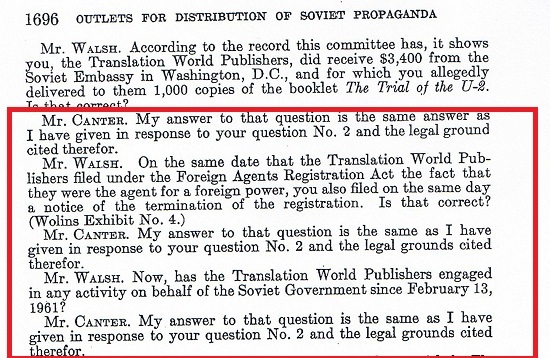 This was in fact the address of Translation World Publishers, which was registered under the Foreign Agents Registration Act as an agent of the Soviet Union. The co-owners, LeRoy Wolins and David S. Canter, were identified by the House Committee on Un-American Activities as members of the Communist Party USA. David Canter was the mentor of a young journalist who later became a high level political consultant. His name was David Axelrod. Coincidentally, Axelrod’s mother Myril Axelrod had once worked for another Communist Party-influenced propaganda publication PM, out of New York. David Axelrod learned well from David Canter, winning several important election campaigns often by blackening the names of his client’s opponents. That’s essentially how David Axelrod got his most important client Barack Obama elected, first to the US Senate, then to the White House. I was really active in both Obama campaigns. Actually I was his precinct captain for his Senate campaign in Illinois. And who can forget what a friend President Obama once was to Moscow? Hillary Clinton‘s involvement in the Uranium One scandal was not her family’s first connection to Moscow. Not long after Bill Clinton became President, he flew to Moscow on Air Force One to meet Boris Yeltsin. Then, on his return flight, he had the plane stop in Prague, Czech Republic. There he visited the Golden Tiger, a Prague pub. The Czech President had arranged a reunion between the US President and the parents of Bill Clinton’s now-deceased Oxford classmate Jan Kopold. The frail, white-haired woman across the table from Mr Clinton at the pub on Tuesday night was Jirina Kopold, who met her son Jan Kopold’s American friend when he visited Prague after a visit to the Soviet Union in 1970. The prominent Czech Communist family seemed to know that young Bill Clinton was destined for great things. Even in 1970, Clinton seemed to be considering a career in politics: ‘We often discussed how to help Czechoslovakia out of its terrible situation,’ Bedrich Kopold recalled. ‘One day we walked past the American Embassy and I said to Bill, ‘Some day you will come back as ambassador or cultural attache,’ and I laughed. Bill looked at me very seriously and said he well might,’ Kopold continued. It is likely that every Democratic Party President from Roosevelt onwards has been helped into power, or influenced in significant ways, by Moscow or its agents. The report published by the White House Council of Economic Advisers examines the cyberattacks cost that malicious cyber activities cause to the U.S. economy. Paganini: How much cost cyber attacks to the US? According to a report published by the White House Council of Economic Advisers last week, the cyberattacks cost between $57 billion and $109 billion in 2016, and things can go worse in the future. 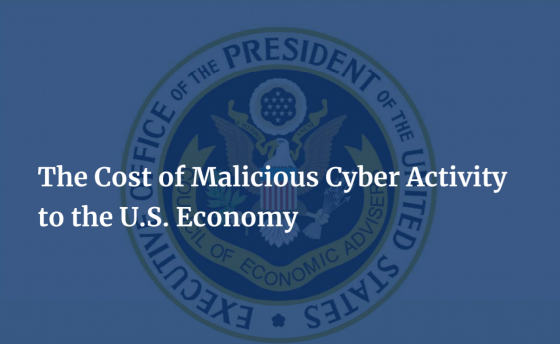 “This report examines the substantial economic costs that malicious cyber activity imposes on the U.S. economy. 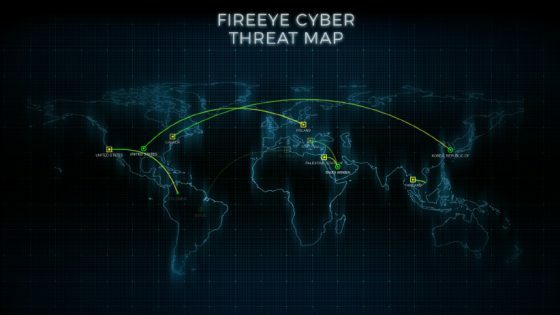 Cyber threats are ever-evolving and may come from sophisticated adversaries. Due to common vulnerabilities, instances of security breaches occur across firms and in patterns that are difficult to anticipate.” states the report. The report analyzed the impact of malicious cyber activities on public and private entities, including DoS attacks, sabotage, business disruption, and theft of proprietary data, intellectual property, and sensitive financial and strategic information. Damages and losses caused by a cyber attack may spill over from the initial target to economically linked organizations. More exposed are critical infrastructure sectors, at attack against companies and organization in this industry could have a severe impact on the US economy. The document warns of nation-state actors such as Russia, China, Iran, and North Korea, that are well funded and often conduct sophisticated targeted attacks for both sabotage and cyber espionage. “Finally, and perhaps most important, if a firm owns a critical infrastructure asset, an attack against this firm could cause major disruption throughout the economy.” reads the report. The reports also warn of devastating cyberattacks that would target sectors that are internally interconnected and interdependent with other sectors. The report offered little in the way of new recommendations on improving cybersecurity, but noted that the situation is hurt by “insufficient data” as well as “underinvestment” in defensive systems by the private sector. In part from Forbes: In 2015, the British insurance company Lloyd’s estimated that cyber attacks cost businesses as much as $400 billion a year, which includes direct damage plus post-attack disruption to the normal course of business. Some vendor and media forecasts over the past year put the cybercrime figure as high as $500 billion and more. From 2013 to 2015 the cyber crime costs quadrupled, and it looks like there will be another quadrupling from 2015 to 2019. Juniper research recently predicted that the rapid digitization of consumers’ lives and enterprise records will increase the cost of data breaches to $2.1 trillion globally by 2019, increasing to almost four times the estimated cost of breaches in 2015. The World Economic Forum (WEF) says a significant portion of cybercrime goes undetected, particularly industrial espionage where access to confidential documents and data is difficult to spot. Those crimes would arguably move the needle on the cyber crime numbers much higher. Large banks, retailers, and federal agencies make the headlines when they are hacked – but all businesses are at risk. According to Microsoft, 20% of small to mid sized businesses have been cyber crime targets. For anyone who wants to tally their own bill from cyber crime, check out Cyber Tab from Booz Allen. It is an anonymous, free tool that helps information security and other senior executives understand the damage to companies inflicted by cyber crime and attacks. More here. Wow! Change is indeed the only constant and it is only the volatility of change that changes. Last Monday I wrote the S & P 500 was on the verge of the worst week since October 2008. Last week the S & P 500 was on track for the best week since 2013. The previous week, selloff was predicated upon stronger than expected growth and inflation. In my view, the pickup in inflation is the real deal. With the continuing tightening of the labor market that is feeding into stronger wage growth, the depreciation of the dollar providing a boost to goods prices and the acceleration of global economies led by the US, all amplified by tax and regulatory reform and an increase in monetary velocity, I think core inflation will be above 2.50% by year end. Wow! This is a dramatic increase from the current 1.8% year over year core increase. This week the FOMC releases the Minutes from its January meeting. As noted many times, 45 days ago, the market had not yet discounted 2 interest rate increases much less than the forecasted three. Will the Minutes suggest the possibility of a fourth? Commenting about the data released Friday, import prices were considerably higher than expected. Sentiment surveys surged to the second highest level since 2004. A sub-data point that I find of great significance is that homeowners saying today is a good time to sell rose to the highest level in a decade with respondents believing that home values will increase by 2% in the next year, the highest since 2007. Many times I have commented about OER or what someone thinks they can rent their home for if the property is indeed a rental. OER is closely correlated to apartment rents and home prices. Rental rates are posting double digit increases for several consecutive years. The data suggests home prices are surging, but this data is skewed by the large urban areas of CA, NY and Northern VA. Generically speaking, home values have still not rebounded back to 2007 levels. Is this about to change as wealth transfers back to Main Street from Wall Street? As noted many times, OER comprises about 30% to 32% of inflationary indices and has been virtually nonexistent since 2007. Will OER accelerate, the result of increased optimism in home prices as measured by the most recent sentiment survey? If so, how will this data impact inflationary expectations and bond prices? Last night the foreign markets were mixed. London was down 0.14%, Paris was up 0.11% and Frankfurt was up 0.07%. China was closed for a holiday, Japan was down 1.10% and Hang Sang was down 0.78%. The Dow should open moderately lower as Treasury yields are heading higher and the dollar is dropping. Oil is up about 1% as OPEC concluded “the markets journey toward equilibrium is gaining speed.” The 10-year is of 7/32 to yield 2.85%.